Review published in IJPE, Vol. 7, No. 6, November 2011, p. 610. Climate Change: Part of Globalization? Prospects for the Debate: Endless Recycling of Arguments or Movement towards Agreement? This is one of the books useful brought out by Earthscan and written by a well-known sociologist which takes us through all aspects of a very important debate that affects the humanity in coming decades. The arguments centre around whether or nor the climate is changing and whether we should be bothered about it. Only scientific investigations and further research can shed light on all the mitigation actions required besides implementing protocols, treaties, and policies by the vacillating Governments of the world keeping their selfish interests aside. This would definitely be tall expectation as post Kyoto Protocol (1997- which came into effect in 2005) experience shows with very few countries have really met the goals set. Each group of countries has a different agenda based on their interests, from protecting economic growth in developing countries to protecting the energy industry in industrialized countries, and each one blaming the other for the problem. In the meantime the greenhouse gas (GHG) emissions continue unabated. In fact as the author points out- “the climate change reflects the broken relationship with the natural world”. 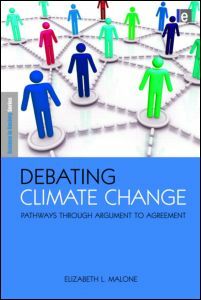 This paperback surveys though how the people with widely varying viewpoints can eventually need agree to address immediate climate change strategies? The author had examined 100 documents ( Appendix 2 –not in serial order) to sift through the variety of arguments and clustered these into families of coherent arguments. This helped her to analyse a common ground of agreement. For example, the first step, the author (a social scientist) suggests is that all these classes of families take the question of climate change seriously. Even the sceptics agree that the carbon dioxide concentrations are increasing although uncertainties on magnitudes of these concentrations may exist. All groups agree that climatic changes involve issues of wellbeing of the society and that GHG emissions are products of industrialization, modernization and increase in population and they all share common commitment to scientific approach. This leads the author to pathways to agreements. Moving towards agreement among host of disagreements, partial agreements and changing knowledge needs to be based on understanding of the potential for agreement. However the author suggests that there is little use in waiting for complete agreement and for solutions that will solve the problem. Action could start on those areas where there is agreement. The reviewer is of the opinion that this book by Elizabeth L. Malone provides an in-depth study and analysis of the problem and makes an interesting reading and a useful resource material on the subject. Review published in the International Journal of Performability Engineering, Vol. 7, No. 6, November 2011, p. 610.